Nearly 300 graduate students and 42 alumni attended the Graduate Student Career Options Conference (GradCON) Saturday, Nov. 14. GradCON brings alumni and students together to network and talk about careers beyond the traditional academic path. PROVIDENCE, R.I. [Brown University] — While it’s true that many graduate students go on to academic careers, that’s not the case for all. 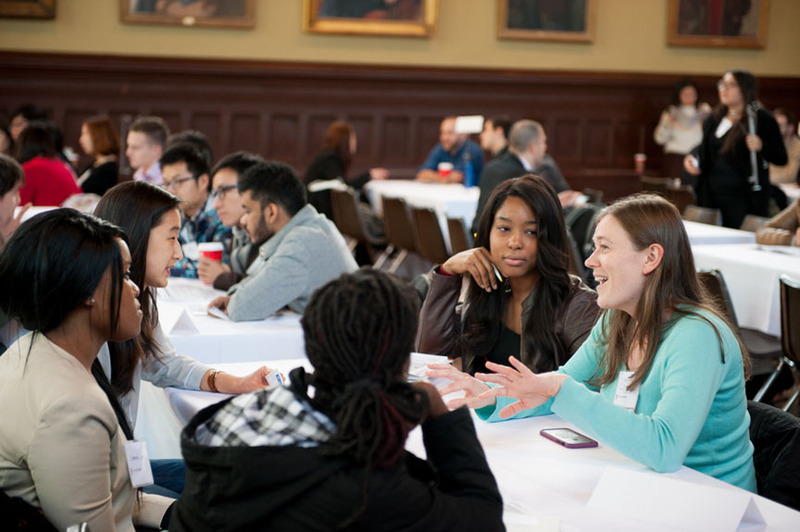 On Saturday, Nov. 14, 2015, the Brown Graduate School hosted its second annual Graduate Student Career Options Conference (GradCON) for students exploring jobs beyond academia. More than 42 Graduate School alumni from across degree programs returned to campus for the weekend to network with nearly 300 students who attended the conference. The day’s events included small group meetings with students and alumni, a networking lunch, and a closing networking reception. There were also several alumni career panels on everything from science research, to the nonprofit sector, to government and business. The goal of the conference was to introduce students to a variety of career options and allow them a chance to network with alumni who have already taken some of those paths. Shiva Koohi earned her Ph.D. in economics at Brown in 2014 and now works for the Federal Trade Commission. She attended GradCON this weekend because she feels it’s important for students to understand the range of career options available to them. “It is important for Brown graduate students to know that there is another world out there, where they can make use of the technical and analytical skills that they learned in graduate school in a more practical setting,” Koohi said. Meeting with alumni who have chosen a variety of career paths inside and outside academe gives current graduate students a better understanding of their opportunities. Student Alexandra Mathwig attended the inaugural GradCON last year and returned this weekend to meet some new alumni. “Attending the conference last year opened my mind to careers that I had never previously considered and introduced me to a network of alumni who could answer the questions I had about whether or not I would be suited to such alternative career paths,” Mathwig said. A Ph.D. student in history of art and architecture who is active in the Sheridan Center for Teaching as well as a member of the Graduate Student Council's Executive Board, Mathwig attended this year to talk with alumni about the decision whether she should go into higher education administration. “The greatest opportunity that GradCon offers is the chance to talk with alumni who have been where I am now and who ultimately chose alternative careers to academia. These alumni can offer tangible advice to any graduate student about the experience of entering the job market after leaving Brown,” Mathwig said. Now in its second year, GradCON is funded by the Office of the President, Graduate School, Alumni Relations, the Annual Fund, CareerLAB, Office of the Dean of the College, Office of Student Life, the Division of Biology and Medicine, and the School of Public Health. While most training takes place within the academic program, the Graduate School provides many resources for professional development. One new program, introduced this year, is the Effective Performance workshop series, designed to introduce students to performance values drawn from improvisational and theatrical techniques. Working with Graduate School faculty and instructors from Trinity Repertory Company, students will use skills introduced in the workshops to improve their communication and presentation skills and strengthen their comfort and confidence in presenting their research in engaging ways. Other opportunities for graduate students include certificate programs at the Sheridan Center for Teaching and Learning, ranging from reflective teaching to mentoring; global mobility grants and Graduate School travel research funds that support graduate student scholarship; and the Brown Executive Scholars Training Program, which prepares advanced master’s students and doctoral candidates for careers in higher education administration. Resources are also available on the Graduate School website. The Center for Careers and Life After Brown (CareerLAB) also offers programs and services targeted to graduate students, including individual advising, the campus recruiting program, skill development workshops, alumni programs, mock interviews, resume/CV/cover letter development, and job search resources. CareerLAB has also developed the Job Search Series for Masters Students, as well as the two series for Ph.D. students: the Academic Job Search, which is done in collaboration with the Sheridan Center, and the Non-Academic Job Search Series for those doctoral students seeking work outside of academia. With Alumni Relations and the Graduate School, CareerLAB developed Grad School LinkedIn groups for sciences, humanities, and social sciences students and also offers access to online resources like Interfolio and Versatile Ph.D., which showcase graduate student career options and support the job search. Students can also track the paths their peers choose. On an annual basis, the Office of Institutional Research (OIR), gathers, organizes and presents alumni outcome data, which is useful for prospective and current students. The data for graduate alumni can be accessed on each program page on the Graduate School website and on OIR’s website.